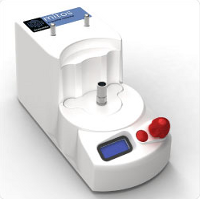 The Mitos P-Pump Remote provides pulseless liquid flow operating over a wide pressure range (0 - 10bar) with excellent response time and accuracy. Pressure driven flow is ideal for microfluidic systems where highly stable flow is required in the nl/min to µl/min range for applications such as droplet formation. The design allows users to connect to Dolomite Remote Chambers of custom chambers with a push-click action.